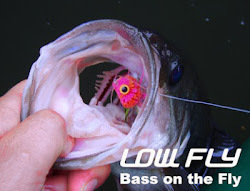 LOW FLY: Favorite Carp Flies. Effective color, white is the most. The floating flies look much like my eggs, which sink, and our bread flies, which sink also. We (my boys and I) have found that even with carp on top while people feed ducks bread, the fish take sunken flies far better. We don't chum, but if people do for us we take advantage of it. I have to assume from what you wrote/pictured that that is what you were fishing. Nice flies, nice fish! 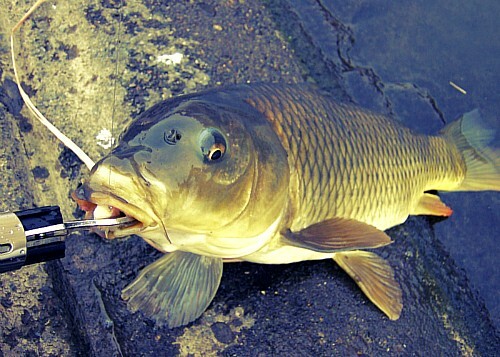 In Japan, too carp on the bottom is not the aim. I fished in a standard dry fly, Float flies(Floating eggs) fished types of photo is best. In Japan, the carp fly fishing in the lake is not so much. It is a common fish in the river. The aim of the carp that prey on the surface of the water. The popper or streamer fished in some cases. Surface of the carp fishing is very exciting. You fish mostly rivers, interesting. What organisms are the carp and your catfish taking the flies on top for? I have just a very small amount of top water carp fishing, and then they are usually on midges or small vegetaion like cottonwood seeds. Oh, carp in ponds where people feed the ducks will feed on top to the large items thrown, but I have not found this elsewhere. Yes, it is exciting. Also, in Japan are most waters public? We here in the state of Idaho just need a license if the water is not private. Japanese catfish,fishing in the river. Since Japanese catfish prey on the frog, the surface pattern is best fished. I like to fish in most Popper and Bassbug. Well catch at the top water lure. Japanese river, fishing can be freely almost anywhere. However, there are rivers require a license is being managed. Catch trout river, a license is required most. My local river, fishing can be freely license is not required. In the river that is, carp and catfish are fished. Hello Jun! I am an American living in Kanagawa and have been fishing for carp on the Sagami River for a few months now. I have found that they look for scuds and crayfish on the bottom a lot. I have not had one take a dry fly yet. 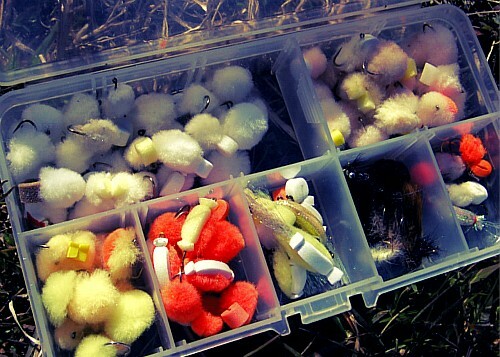 So I will keep trying and tie more flies if I need too!!!! Tight lines and have fun!! Mullet on the Fly In the River.